This bright and flavorful, award-winning triple-milk cheese from Hook’s Cheese in Mineral Point is as fun as its name implies. Made with milk from sheep (ewe), cow (calf), and goat (kid), it’s a complex, veiny blue cheese crafted by high school sweethearts and Hook’s Cheese owners, Tony and Julie Hook. One of the many reasons to celebrate this cheese: it’s the first triple-milk blue produced in the U.S. We love how each milk shines in this mouthwatering Wisconsin original -- creamy cow, earthy sheep and zippy goat -- all in one. We like Ewe Calf to Be Kidding at room temperature. Wash the knife after slicing or cutting this blue, since milder cheeses will get overpowered by this residue of this powerhouse. 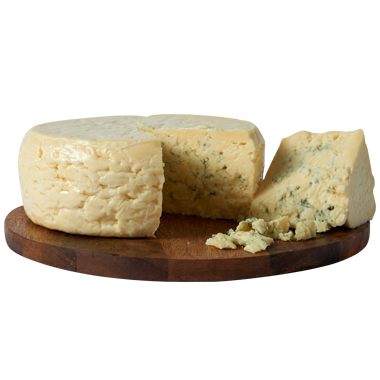 We like to team this unique Wisconsin blue with white wines, beers and cider. For wine, champagne, chardonnay, riesling, müller-thurgau and sauvignon blanc are great. For beer, reach for amber ale, Belgian ale, bock and brown ale. We can’t get enough of this ultra creamy cheese. Try tossing it in a salad with a citrusy vinaigrette and a healthy dose of dried Wisconsin-grown cranberries. It’s also fantastic blended into a dressing for a classic wedge salad. It holds forth on a cheese board too, especially when accompanied with other simple pleasures like fruits, nuts, chutneys, pickles and a selection of cured meats.